SoftPlanet makes it possible for everyone to get free Active MP3 DJ Studio download directly from our servers. There is no registration needed for downloading. Being a DJ can be a hard job, because you have to work with a lot of songs in order to create the best set. Active MP3 DJ Studio will help you with that job, because the application can create a playlist of audio files that you can load at any time and then you can start mixing them. The program offers a lot of instruments which allow you to control the audio in a lot of ways. But this capable application comes with a demo version. If you want to buy the commercial version you must prepare USD 399.00, but for more licenses the price drops. When you start the app, it will open the Audio options window, where you can choose the device and the speakers that you will use. Also, you can select the output device for Decks Master and Monitor and the latency and waveform. After that you are ready to use the instruments, which include fade, equalizers, playback rate and more. The interface of Active MP3 DJ Studio is only one window, where you can use the various utilities of the application. It is divided into three panels – one for Deck A, one for Deck B and the Playlist. Every deck has the same utilities, but they share the fade and equalizer tools. It took us some time to understand how to add files, because the Load button is used for loading playlists, not audio files. These files are loaded from the button “Add sound files”. After you create the list with audio files, you can save it and load it later. The only limitation that you have with the Demo version of Active MP3 DJ Studio is the fact that it will close the window of the program after some usage. You can restart the application and you can use its functions again. This can be quite annoying if you are working at the moment. But if you use it for home enjoyment you might get used to the closing of the app. 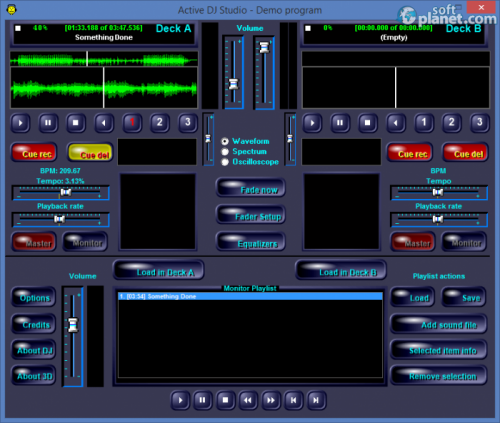 Active MP3 DJ Studio gives you a lot of instruments, which let you control the audio files in many ways. The program is paid, but you will have at your disposal two digital mixing decks that will allow you to change almost every aspect of the audio. Active MP3 DJ Studio is VIRUS-FREE! Our security scan shows that Active MP3 DJ Studio is clean from viruses. The current version of Active MP3 DJ Studio has been scanned by our system, which contains 46 different anti-virus algorithms. 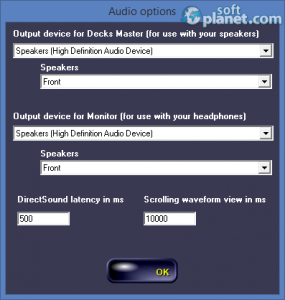 That ensures that Active MP3 DJ Studio 6.4 is 100% safe for your computer.